This is a one day kitesurfing course that is very informative. It involves learning about different types of kites and associated equipment, whilst also addressing safety issues before starting out on a trainer kite. Whilst piloting the trainer kite you will learn the theory of the wind window. The wind window is the theoretical explanation for the way the kite flies to create its power. *Please note. This is a rough guide. Everyone learns at different speeds so you may not learn all of the course content in one day. Our instructors will determine whether they feel you are competent in what you have learnt so far before you can progress to the next stage. Hunstanton Watersports offer a wide selection of kitesurf courses from novice / beginner to intermediate and advanced – all under the supervision of BKSA approved instructors. 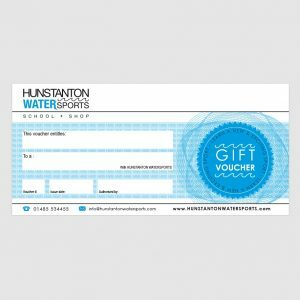 Kitesurf Gift Vouchers are available online so you can give the gift of kitesurfing to your friends and family.